Nike sponsors many high profile athletes and sports teams around the world, with the highly recognized trademarks of "Just do it" and the Swoosh logo. Nike is the world's leading supplier of athletic shoes and apparel and a major manufacturer of sports equipment. Nike Pro 2.5" Compression Shorts - Nike Pro 2.5" Compression Shorts - Women's The Nike Pro Compression Short is an engineered stretch, body-fitting first layer. Dynamic fit and superior technical fabrics provide optimal ventilation and moisture management. Strategically designed seams offer enhanced comfort for performance. Dri-FIT® 82% polyester/18% spandex with 100% Dri-FIT® polyester gusset. 2.5" inseam. Imported. Machine wash cold, line dry. Compression Fit keeps everything tight to the body for maximum support during high-performance activity. Nike Air Max Wright - Take it to the next level of comfort and style when you wear the Nike Air Max Wright casual shoe. This low-profile kick is perfect for your feet, creating an innovative fashion without compromising function. The upper is leather and synthetic, the heel has a visible Air-Max unit and the outsole is made of rubber for secure traction. Wt. 18.1 oz..
Nike Dart 9 - Nike Dart 9 - Men'sA redesigned upper keeps the Nike Dart 9 going the extra mile for entry-level runners. It is ideal for high-arch, neutral runners with little to no pronation. Main Features. Additional Information. This version of the Nike Dart offers a redesigned upper that does away with multiple thin overlays and instead supplies support and durability with a few wide synthetics that offer increased ventilation. Ideal for runners who log up to 20 miles per week, the Dart 9 gives the long-lasting comfort of a full-length Phylon midsole and a plush sockliner. Nike Tempo Short - Nike Tempo Shorts - Women's Curving lines give this Nike Tempo Short a modern look while preserving its fit and flair. The microfiber and low-rise construction combines for a comfortable fit. Tapered mesh side insets provide ventilation and allow for an ideal range of motion. An elastic waistband with internal drawcord adds easy adjustment. Built-in Dri-FIT® crepe liner and an internal card/key pocket. Swoosh design trademark embroidered at the left hem. 100% Dri-FIT® polyester. 3.5" inseam. Nike Hyperdunk - Nike Hyperdunk + Sport Pack - Men's The Nike Hyperdunk+ basketball shoe tracks every move of your game, and syncs directly to your phone, letting you know exactly how high, how quick and how hard you play. The upper features the most advanced version of Flywire, which uses high-strength cables for support and stability. These responsive cables are loose when at rest and dynamic in motion, tensing to help stabilize the foot. Nike Shox Deliver - Nike Shox Deliver - Boys' Toddler Delivering a sleek look with a hoops-inspired upper, the Nike Shox Deliver brings you just what you need to style it up wherever you go. There is a leather upper, Nike Shox columns and a rubber outsole..
Nike Zoom Victory - Nike Zoom Victory - Men's The Zoom Victory is the lightest middle-distance spike ever made by Nike. High-strength Flywire technology works to minimize overlays and maximize the strength and durability of the spike. Compression-molded Flashlon foam midsole offers a lightweight, responsive foot strike. Zoom Miler plate design provides added comfort and traction on the track. Improved TPU sharkskin delivers grip on any surface. For 800-5000 meters. Includes 1/4" pyramid spikes and a wrench. Nike IN-Season TR 2 - The Nike In-Season Trainer 2 training shoe is perfect for your light workouts and recovery days. Innersleeve constructed upper provides ease of entry and secure lockdown. Memory foam sockliner gives superior comfort underfoot. Full-length Phylon@ midsole offers superior lightweight flexibility. Strategically placed rubber pods bring excellent traction and durability. Flex grooves in forefoot allow the foot to move in a natural motion. Wt. 7.3 oz..
Nike Mavrk Shoes - Nike SB Mavrk Mid 3 - Men's The Nike Mavrk Mid 3 combines an old-school sole with an increased performance skate upper, resulting in a classically designed shoe that any skater can rock on and off the board. A plush suede, leather and nubuck upper sits atop a Phylon™ midsole and a vulcanized rubber sole for increased flexibility and board feel. Removable insole. Wt. 12.3 oz. Long-lasting suede and leather materials on upper for durabilityLunarlon construction provides spring-like rebound and cushioning by placing softer foam inside a wrap of denser foamSynthetic mesh liner adds the breathability needed for skating in warm weather. Nike Musique IV - Nike Musique IV - Women's The Nike Musique IV training shoe features a lightweight mesh and synthetic leather upper. Midfoot strap provides support during dance activities. Heel and forefoot are double-lasted to offer low-profile added stability. Phylon™ midsole adds lightweight cushioning. Non-marking green rubber gives traction. Enhanced radius edges aid lateral transition. Medial forefoot pivot point. Wt. 9.4 oz. Phylon midsole provides lightweight cushioning. Lace-up front with a mesh-lined tongue for optimum fit and feel. Nike Free TR2 Winter - Don't let the cold weather slow down your training routine. The Free TR2 Winter doesn't compromise in support, breathability or movement. And it's in a winterized package for enhanced coverage from the elements. Deep, molded Nike Free sipes along the length and width of the midsole in a multi-directional pattern for excellent flexibility and articulation. Full-length unit sole midsole and outsole construction for lightweight cushioning and comfort. Fleece lining for insulated warmth. Nike Air Monarch IV - Nike Air Monarch IV - Men's The Nike Air Monarch IV training shoe is made for the athlete looking for great cushioning with a comfortable and versatile upper. Durable, supportive leather upper. Lightweight Phylon™ midsole with full-length, encapsulated Air-Sole™ unit delivers additional cushioning from heel-to-toe. Durable solid rubber outsole with aggressive traction pattern..
Nike 5 Gato Leather - Nike Nike5 Gato Leather - Men's Need something to boost your soccer game? The Nike5 Gato Leather soccer shoes are just the thing to amp up your game performance and look! The leather upper with a toe-and-medial overlay is designed for durability. The mesh panels are made for maximum breathability to help keep your feet dry. The midsole features new soccer-specific Cushlon technology that provides small-sided cushioning while maintaining stability. Nike Shox NZ - Nike Shox NZ - Men's For those that love the ride and response of the Nike Shox, but want a lighter, faster and more nimble ride, the Nike Shox NZ is the perfect combination. A one-piece construction provides a more fit upper, while a ghillie lacing system wraps the foot to the midsole. It still has the original Nike Shox four-column unit in the heel for excellent cushioning. A Phylon™ forefoot gives performance and responsiveness. 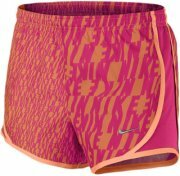 Nike Tempo Short - The Nike girl's Tempo Short: Lightweight warm-weather comfort. This short is just like Mom's favorites, only smaller. Whether she's running or playing, they offer great range of motion and sweat-wicking power to help her stay comfortable. Machine wash cold, line dry. Interior brief lining for extra comfort. Elastic waistband with drawstring tie provides a secure fit. Classic Swoosh logo located at left hem. Dri-FIT high-performance polyester fabric wicks perspiration away from your body and towards the surface where it can evaporate.100% polyester. Nike Ruckus Mid 6.0 Skate Shoe - If trouble is your kid's middle name, than the lightweight Nike 6.0 Boys' Ruckus Mid Jr Skate Shoe and your son are a match made in heaven. Wickedly grippy rubber outsoles give him the traction he needs when skirting the authorities, and its rubber sidings help protect his toes and add durability to the shoe. Breathable synthetic uppers with overlays keep his feet comfortable while the shoes' mid-height ensures he doesn't bang up his ankles when pedaling like mad to get away from angry neighbors..
Nike Element Half-Zip - Take your running style to new heights in this Nike® Element Half-Zip. Dri-FIT™ high-performance polyester fabric wicks perspiration away from your body and towards the surface where it can evaporate. Stand collar. Half-zip closure at front allows for easy on and off. Long sleeves with banded cuffs and thumbhole details. Allover heathered appeal with contrast topstitching. Cord management loop at back of neck keeps media player cords tucked away. Reflective elements increase visibility in low-light conditions. Nike Extended Sizing Tempo Track Short - Stay in step with these Dri-FIT Tempo Track Shorts from Nike®. Dri-FIT™ high-performance polyester fabric keeps you dry by wicking perspiration away from your body and towards the surface where it can evaporate. Imported. Elastic waist with interior drawstring provides a comfortable and secure fit.100% polyester. Dri-FIT high-performance polyester fabric keeps you dry by wicking perspiration away from your body and towards the surface where it can evaporate. Nike Zoom Matumbo - Nike Zoom Matumbo 2 - Men's The Nike Zoom Matumbo 2 track spike features high strength Flywire technology that minimizes overlays and locks the shoe to your foot. Phylon™ midsole with carbon fiber midfoot shank provides cushion and support. Four-spike, Pebax® three-fingered plate offers increased traction. Includes ten 1/4" spikes and a wrench. Wt. 4.2 oz. Lightly padded tongue and molded collar add comfort. Sharkskin heel pad allows for optimal grip on a variety of surfaces without adding weight. Nike Dual Fusion Run - The Nike Dual Fusion Run 3 Running Shoe in Cool Grey/Black/Hyper Blue/Volt for Men is an excellent running shoe that provides exceptional comfort while running. Nike Dual Fusion Run 3 has a breathable mesh upper and dual-density Phylon midsole for support that forms to your foot while running. For long distance runner, the Nike Dual Fusion Run 3 is perfectly springy and responsive with mesh ventilation so that feet can breathe easy. Nike Crew Socks 3 Pack - Take the park by storm in the supreme comfort of these ready-to-shred Nike® socks!for a more secure fit. Half-cushion terry knit footbed supplies shock absorption and added comfort. Nike logo at cuff. 60% polyester, 26% nylon, 12% cotton, 2% Spandex. Imported. Snug, secure Fit. Superior fit and cushioningArch supportHalf cushion terry knit footComfort and shock-absorptionAnatomical left and right. Nike Pacer Short - A modern update to the Nike 'Tempo' short, the 'Pacer' short belongs in every runner's wardrobe. Swoosh design trademark at the lower left hem and NikeFIT trademark heat transfer at the back right hip. Dri-FIT fabric helps wick moisture away from the skin to keep you dry and comfortable. Low rise front for a comfortable fit. Wide elastic waistband with internal drawstring adjustment. Sculpted mesh insets for greater breathability. Built-in key pocket is able to house your on-the-go music solution..
Nike Benassi Solarsoft Slide - Nike Benassi Solarsoft Slide - Men's The Nike Benassi Solarsoft Fuse Slide blends innovative Hyperfuse technology with the ultra-soft comfort of Solarsoft foam to provide maximum comfort and style. Breathable, flexible upper features innovative Hyperfuse technology and is constructed without stitching for seamless comfort. Dual-durometer midsole/outsole features a soft, pliable Nike Solarsoft foam midsole with built-in grooves that add optimal airflow and drainage. Nike Solarsoft foam in a harder durometer gives durable traction and stability. Nike Sweet Classic Leather - Nike Sweet Classic Leather Winter - Men's What's old is new again with the Nike Sweet Classic Leather Winter shoe. This time-tested style gets a cold-weather makeover. It's made with a soft leather or nubuck suede upper with perforations for breathability. Below sits a Phylon™ midsole and rubber outsole for maximum comfort and traction. Wt. 15.3 oz. Phylon midsole provides ample cushioning. Smooth textile lining and a cushioned footbed add comfort.